Nov 13, 2018: Ironwood gets 13 inches of snow! For more info see WEATHER CHANNEL & SNOW DEPTH LINKS page. If you are arriving in Ironwood from Wisconsin, this will be your first opportunity to sample a Yooper delicacy - the Pasty. A portable pastry filled with meat, onions, potatoes, rutabagas, and carrots the Pasty was brought to the UP by Cornish miners but spread in popularity by immigrants from Finland because it resembled a popular food from their home country. Just take a drive into the downtown area and it won't be hard to find a restaurant offering Pasties. 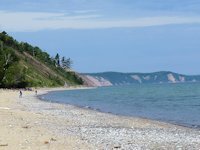 Ironwood is also home base for two of our favorite agate-hunting beaches, Little Girls Point and Black River Harbor. Both sites are also recreation areas with picnic grounds and campgrounds. 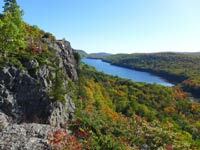 And Black River harbor also has some terrific hiking trails and some of the more impressive waterfalls in the UP. 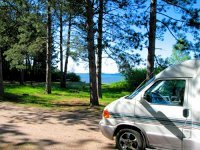 As most often we are RVing in our Rialta, we stay at one of the two Ironwood area Lake Superior campgrounds. 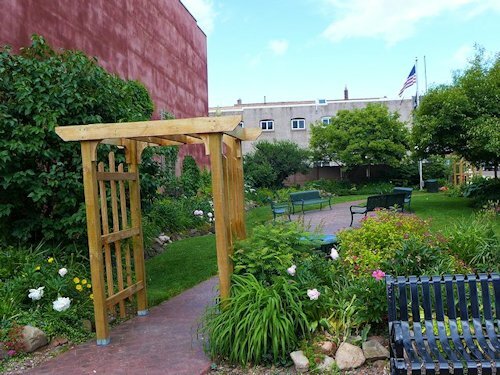 But for travelers needing lodging, there are a number of reasonably-priced motels offering clean and comfortable accomodations. Besides restaurants and lodging, other Ironwood attractions include the 1892 Ironwood Depot (home to the Railroad Museum and the Ironwood Chamber & Visitor Center), the 52 foot high statue of Hiawatha, the Ironwood Country Club golf course, and the Stormy Kromer factory tour (see our article and photos here). Ironwood is also close enough to use as a home base for exploring nearby Porcupine Mountains State Park, a huge natural area noted for outstanding hiking trails, scenic vistas, impressive waterfalls, and Lake Superior beaches. In the fall, Ironwood is our jumping-off spot for several impressive scenic fall color drives and in the winter time, Ironwood serves as home base for downhill skiers (four ski areas within 20 miles) and snowmobilers. 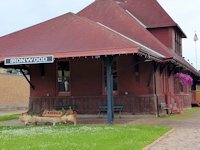 The Ironwood Depot is a good first stop to learn about the history of Ironwood and get information on things to see and do. 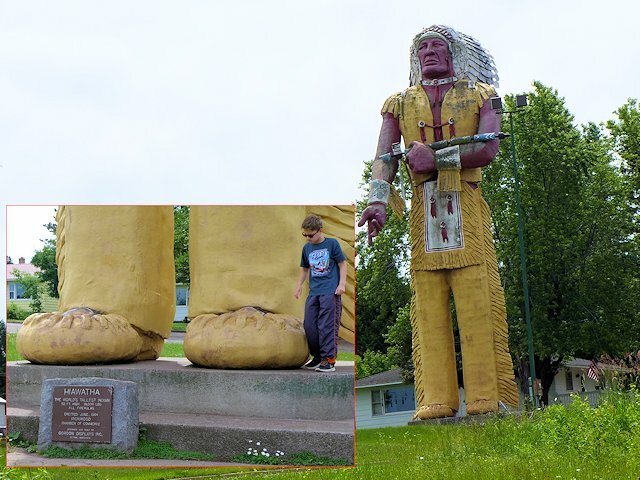 Ironwood claims its 52 feet high Hiawatha statue is the world's tallest Indian! 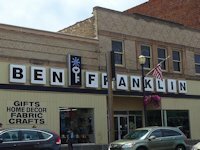 A throw-back to an earlier era in merchandising, the Ben Franklin store offers a wide range of items for sale and a good place to shop for gifts as well. 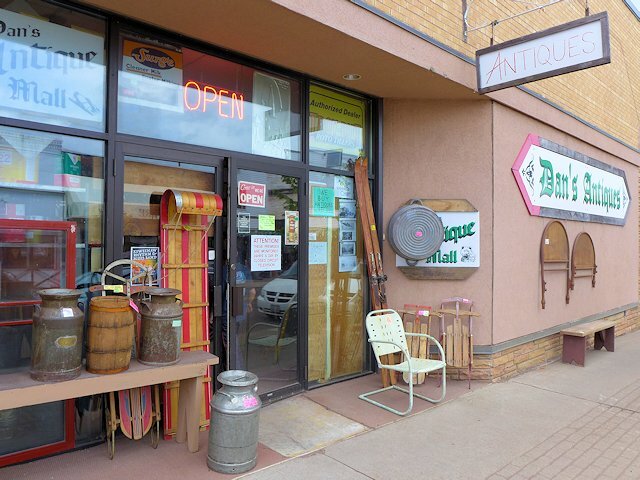 Another fun shopping stop is Dan's Antiques. 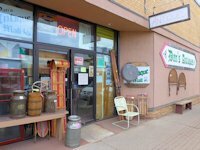 It is more than an antique store but a place where you might find something useful that just isn't made any more or very hard to find. A definite must-see stop in Ironwood is a tour of the Stormy Kromer Factory (see our article and photos here). The tour staff does a first rate job on what is an very interesting tour. 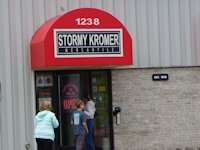 Stormy makes quality apparel and a variety of other goods here in the USA, providing jobs that too often have gotten shipped to China. A bonus of the tour is being able to shop at the company store where you can also get some good deals on seconds or discontinued items. 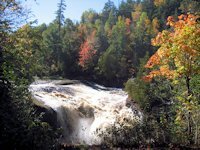 Rainbow Falls is the last of 5 attractive waterfalls on the Black River that empties into Lake Superior. The Black River Scenic Recreation Area is one of our favorite spots for hiking, scenery, and agate & rock picking on its Lake Superior beach. 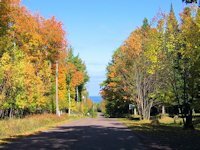 One of our favorite fall color drives runs from just north and west of Hurley from US Highway 2 towards the lake and Saxon Harbor, then crosses into Michigan to Little Girls Point. From Little Girls Point you can return through the wooded hills and hardwood forest away from the lake and eventually connect with the Black River Scenic Byway that will return you to the lake shore. 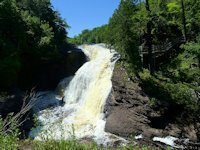 Learn More about the Black River Scenic Byway and our this color tour drive here. 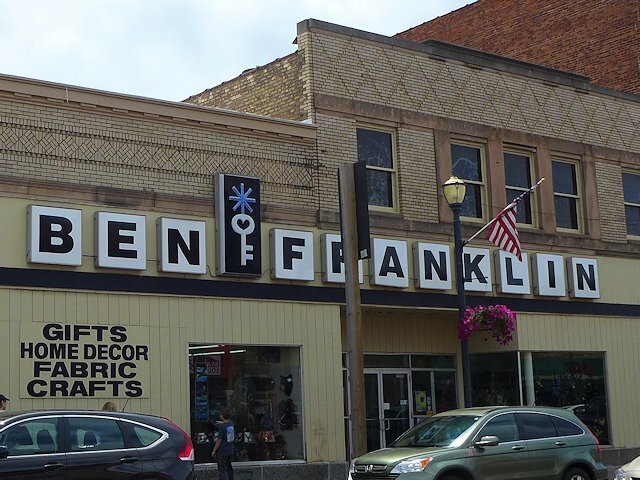 Instead of doing a loop from Black River Harbor to Little Girls Point and into Wisconsin, return to Bessemer and proceed east on US 2 to Wakefield Michigan where you take Michigan 519 to Presque Isle Park (with more waterfalls and hiking trails). 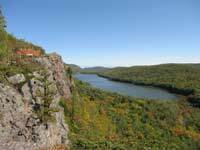 From there you can take the South Boundary Road to visit several scenic overlooks in Porcupine Mountains State Park.